As anyone who knows me knows, I enjoy saving the best for last. My case in point, Linden Vineyards. 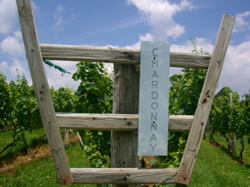 The 5000 case winery and vineyard is located on the Blue Ridge in Linden, Virginia. Owner and winemaker, Jim Law, is highly regarded in Virginia wine circles for producing world-class wines. 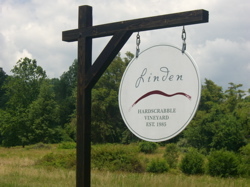 From the polished Hardscrabble Chardonnay to the spicy Petit Verdot, Linden produces elegant, age-worthy wines for every palate. Linden is surprisingly difficult to find with few signs (I can only assume they prefer to stay boutique versus commercial, which isn’t a bad thing). The rustic winery, reminiscent of a ski lodge, sits atop a hill with picturesque 360 degree views. After enjoying the views, we made our way to the tasting counter where we were handed a tasting sheet. The tasting is complementary and includes 5 wines. The reds outclassed the whites, led by the ’05 Claret and ’06 Petit Verdot. The Petit Verdot retails for $28 and is one of the best in the state. A focused effort with pepper, blueberries, and nice tobacco notes. Too good to leave without a bottle. After our tasting, I decided to participate in the cellar tasting for $12 to sample a selection of single vineyard and library wines. Our small group was led downstairs to the private cellar by our tasting associate Laurie. Surrounded by wooden barrels and lit candles, the atmosphere is warm and intimate. Laurie took us through a flight of 5 wines, which included the 2006 Hardscrabble Chardonnay, 2007 Boisseau Chardonnay, 2006 Hardscrabble Red, 2006 Avenius Red, and 2005 Late Harvest Vidal. It was a great opportunity to compare and contrast the different vineyards and blends. All were outstanding, with the Hardscrabble wines taking gold. 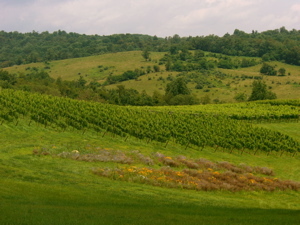 In summary, Linden Vineyards represents the true potential of Virginia as a wine producing state. No matter the wine or vintage, Linden is the definition of excellence. Be sure to check out more pics of my visit to Linden Vineyards on Flickr! 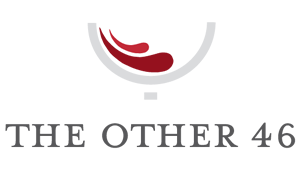 Remember to drink local and be sure to click here to vote TheOther46.com as your favorite wine blog! You forgot to tell your readers one large salient point. If you are not a member of their case club, you are not invited to enjoy the view on their deck on a Saturday or a Sunday. So, if you plan to visit, skip school and visit during the week. I actually didn’t pay too much attention to the rules and regulations, although, I was a bit surprised to overhear our tasting associate tell a group of ladies that the grounds required a case purchase. Needless to say, it was a bit awkward standing outside taking photos after that tidbit. I did a little more research, and come to find out, the deck and grounds are actually off limit everyday (unless you’re a case club member). Which is unfortunate, because the grounds are beautiful. I plan on discussing this in more detail in an upcoming post. I’m hoping this doesn’t become the norm across Virginia wineries. Thanks again for your comments and readership. Cheers! Linden is a beautiful winery and this is a very nice write up; however, their lack of customer service was a complete turn off during my visit. While I absolutely love their wines, I hated the attitude I received from the employee who served me. Also, it was extremely evident the winery is not family friendly and they made me feel uncomfortable and unwelcome. 1. The winery grounds were ONLY for case club members. 2. Children are NOT allowed downstairs for the barrel tasting. She then proceeded to offer a pair of grounds passes to 2 tasters beside of me. She did not offer me and my baby passes even though she knew the rest of my party was going to participate in the barrel tasting. Instead, we opted to wait in our car. Even though I would have loved to enjoy the views outside, I didn’t want to take any chances walking around and having the employee chase me off the property or something. I will think twice before ever returning to Linden. If I want their wines, I will purchase from Salute Wine Market in downtown Winchester and avoid future harassment. Wow, I thought the restrictions were only on the week ends. I guess that means I won’t be visiting any time soon. Particularly in light of the fact that there are plenty of Virginia Wineries. I guess I will head off to Chester Gap Cellars. Better view, equally as nice wines and no attitude. Bring a picnic lunch. Apparently Warren County has some silly rules about the winery serving even pre packaged food items. I am a case club member and take many guests to the winery as Linden wines are a cut above any others in the region. The restrictions only apply on Saturday and Sunday so head out on a Friday afternoon, or better yet buy a case and enjoy anytime for a year. For once the price of the wine is worth it unlike many other VA wines which are overpriced for the quality you get. Couldn’t agree more about Linden. First class wines that deliver on every level. The Hardscrabble wines are top notch and can easily hang with the big boys in California, Washington, and Oregon! Had plans on visiting winery at Linden. After reading these comments, that will not happen. A good product and lousy service=A Bad Product. Thank you for your readership and comments. I’d hate to see you not visit Linden based on one persons opinion. Jim Law is making Virginia’s best wines and the winery is one of the most picturesque wineries in the state. In fact, my mother recently visited and had a wonderful time. She and her friends enjoyed the great wines (which by the way the tasting is complimentary) and shared a bottle on the patio. She also participated in the reserve tasting and commented on the great tasting associates. That said, does Linden frown on large tasting groups, yes. Perhaps even rambunctious toddlers. Jim’s mission is to produce the best wines in the state and is focused on creating an environment for visitors to discuss and appreciate the wines. It would be a shame to not visit. Trust me, you’ll be happy you did. Hope to see you on the wine trail! Cheers from TheOther46! If you’re skipping a visit to Linden because a handful of people on the internet have had their feelings hurt by Linden’s case club/patio policy, then you’re making a HUGE mistake. Likewise if you’re put off that some of the tasting staff won’t give you the warm & fuzzy entry that you may get elsewhere. I personally have been pleased with my interactions with Linden staff. I was aware of the case club/patio policy ahead of time – it IS spelled out very clearly on their website. And I don’t expect every winery to be kid-friendly. I’m annoyed by dog-friendly places, so it stands to reason that people would be annoyed by my kids. I would be annoyed by my kids if I wanted to experience a new winery. My wife and I recently completed a 17 winery tour of the greater Front Royal wine scene – including spots in Delaplane, Amissville, Hume, and of course Linden. In general, the wines at Linden Vineyards sat head and shoulders above all the others. The only place that rivaled Linden was Glen Manor, no surprise considering that Jeff trained under, and has sold grapes to, Jim Law. Jeff also has a wonderful property, which obviously helps. But it would not be a stretch to say that Linden has the most complete offering in VA, in that none of their wines are duds, IMHO. I can’t say that about any other VA winery I’ve visited. Linden’s wines also withstand a crucial test – one that many VA winery fail – in that their wines are just as good (or better!) once you get them home. We drank a bottle of the ’09 Claret last night and it was rock solid. On second thought, don’t go to Linden. More for me!